TradeNagger is a simple app designed for day-traders. You fill it up with trading advice, and then it will nag you all day by repeating the advice every few seconds. 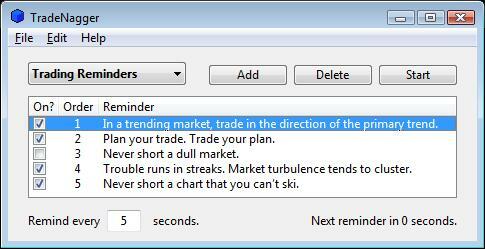 This is a great way to learn, and make sure that you stick to your trading rules. Click to hear what TradeNagger sounds like. The sample above plays a reminder every five seconds in the interest of saving time here. While trading, you would probably set it to a longer interval, like every 60 seconds. TradeNagger uses the text-to-speech feature built into your computer. The sample above uses the Windows “Anna” voice. On the Mac, you have several voices to choose from in the “Speech” control panel – both male and female. TradeNagger is very simple to use. The only thing that isn’t obvious is how to re-order reminders. To do that, click in the “Order” column of the reminder that you want to move, hold the mouse button down, drag it up or down, and let go. You can have multiple groups of reminders. To make additional groups, go onto the “File” menu and then to “Add Category”. The new category will appear in the pop-up list in the upper-left corner of the screen; where it says “Trading Reminders” in the screenshot above. You can use TradeNagger completely free of charge – unless you want to have more than five reminders per category. Then you will have to cough up some cash. What is a Chart Gap? How Long Does it Take to Install WordPress?